Recently someone asked me for advice on sanding disks. That is easy! I have been using these for the last 4-5 years and I am very happy. Note: Recently Craft Supplies USA started selling some “Deerfos” blue sanding disks. I don’t think they are the same. They are made by a different manufacturer. I found something I like and it’s not broke, thus, I am sticking with Vince. I use 2-3/8” disks and 3-3/8” disks Blue Flex Disks. 80, 120, 150, 180, and 220 grits. Around $8 for 50 disks on 11/18/2014. The velcro on Blue Flex disks is glued onto a very tough sandpaper. They work wet or dry. Heat will build up and soften the glue if you sand aggressively with these disks. When you try to remove the disk the velcro will get screwed up. To avoid this problem you need Innerface Pads! I use 2-3/8” & 3-3/8” to Innerface Pads that match disks. 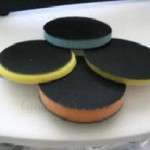 I use 1/4” thick “Firm Yellow Tapered Innerface Pads” for 80, 120, and 150 grits. I use 3/8” thick “Soft Blue Innerface Pads” for 150, 180 and 220 grits. 1 interface pad for each grit works best! Allows quick and easy grit change without screwing up the velcro. I like the “Heavy Duty Low Profile Backup Pads” (only sold by Vince?) better than the thicker pads. They are better are getting into the tight space between headstock and bowl. If you are using innerface pads to adjust softness of pad then you don’t need and really don’t want a thick back up pad with lots of flex. I like to use a low profile angle drill for my sanding on the lathe. One of the $40 ones available from Amazon, Harbor Freight, etc. See photo. I have 2 of them. One for 2″ disks and one for 3″ disks.